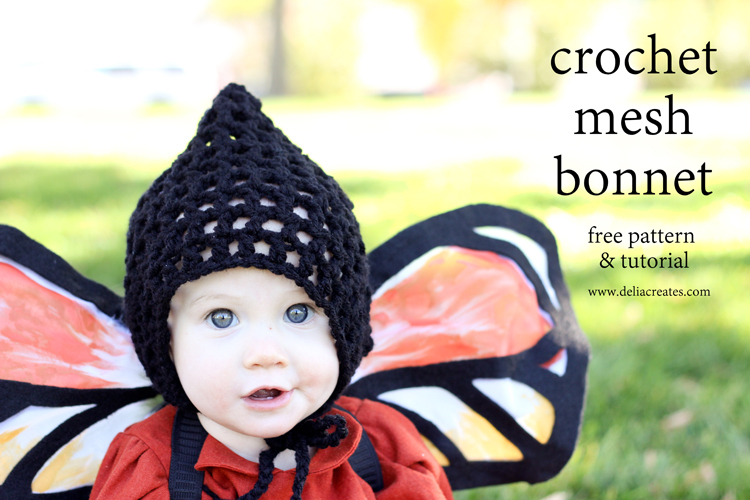 Simple Crocheted Pointed Bonnet – Free Toddler Size Pattern! 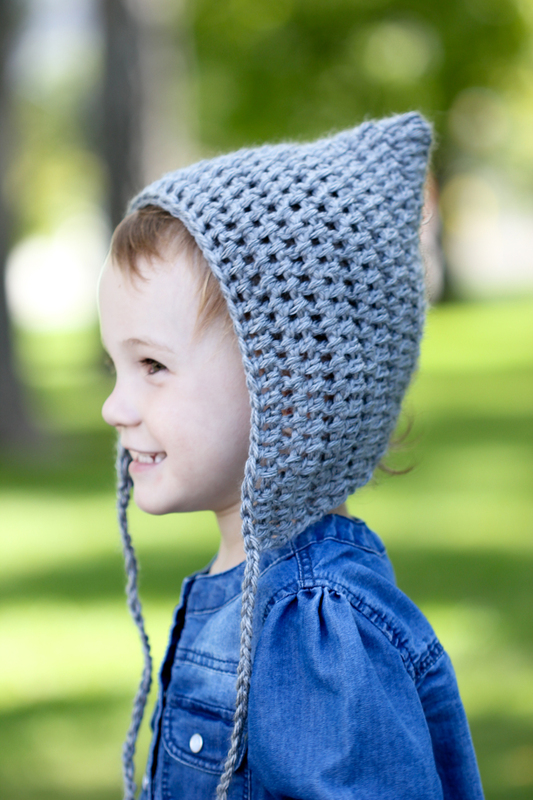 I don’t know what it is about them, but I think pointed bonnets should be in every baby’s wardrobe. They are so cute I tell ya! 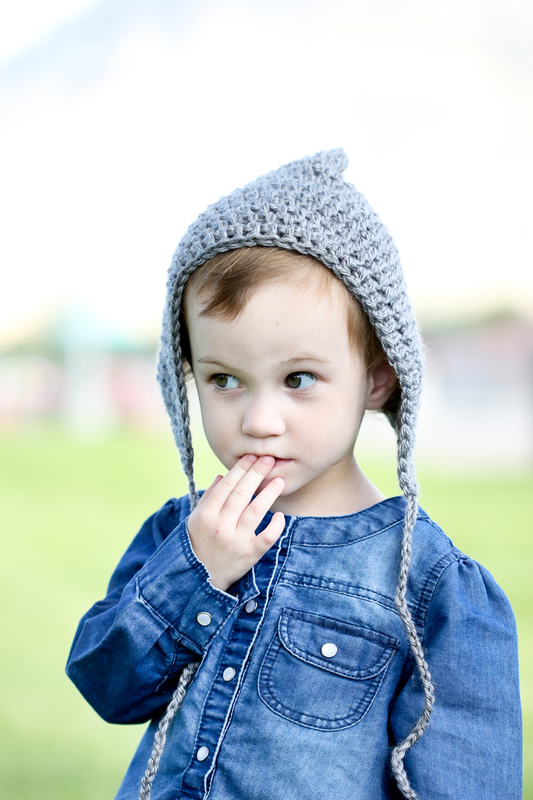 I made this mesh one for Natalie a couple of years ago, and then shared a free pattern for it last year HERE. I had several requests to make a non mesh version, but couldn’t quite get the shaping figured out…until now! 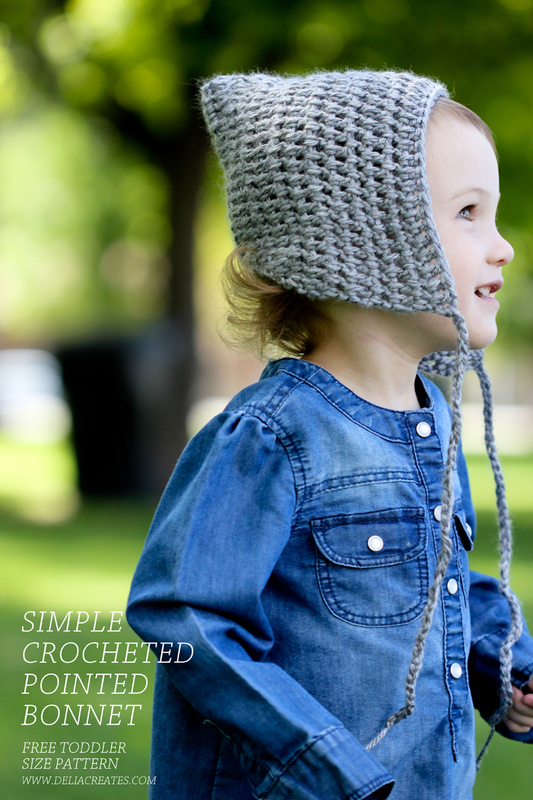 The construction is still very similar to the mesh one, so it makes for a really simple project, but that also means it doesn’t hug the head and neck in quite the same way as a hat crocheted in the round does. That was the problem I originally had when I first tackled this project. 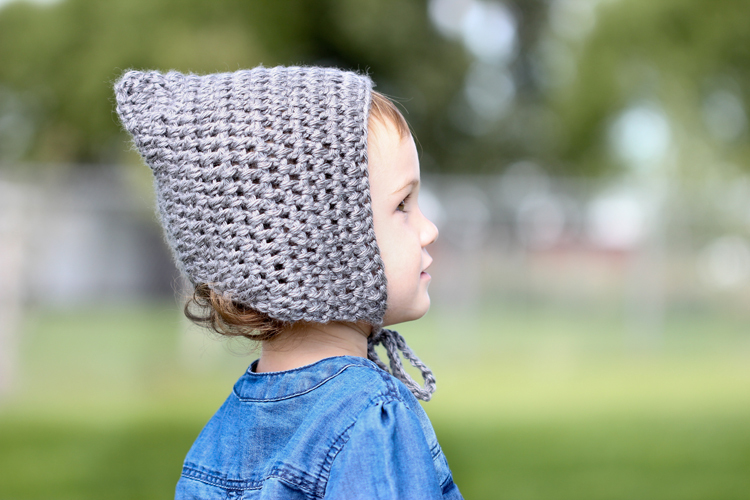 It would pucker and slouch unattractively at the back, because the hat itself is not crocheted in the round and it couldn’t rely on the stretch of a mesh stitch to make it work. I wanted to maintain the appeal this pattern had to newbie beginners by avoiding the round, so I tweaked it here until I got a shape that is a fun, cute design and easy, easy to do! It is also crocheted semi- loosely, so it’s still a bit mesh looking, but not as much as the original. 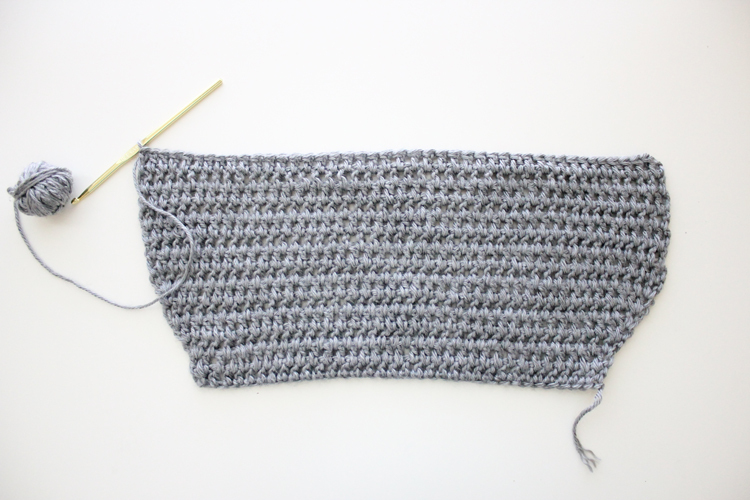 It’s great for beginners, as I mentioned, but if you aren’t new to crochet, it’s a fast, satisfying get it done in one afternoon type project. 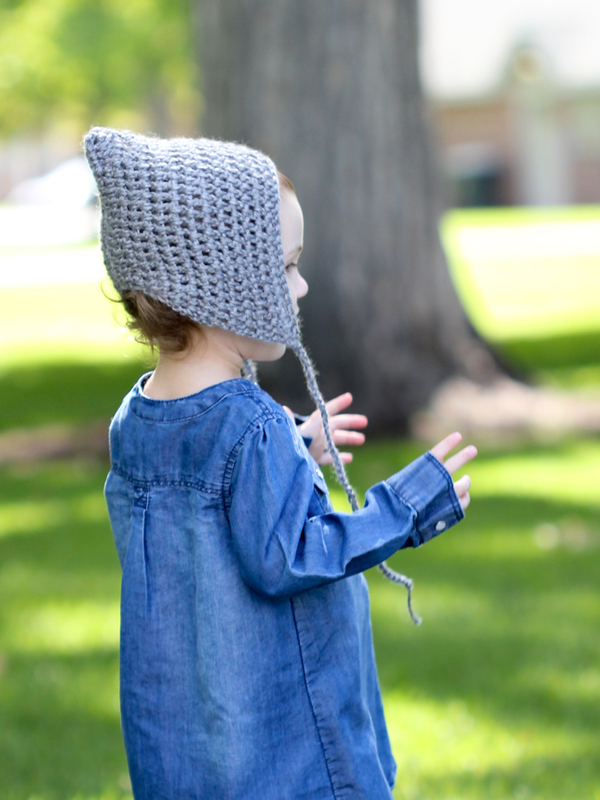 I’m sharing this as a free toddler size pattern for head circumferences that are approximately 18-20″ or for 18 months to 3 year olds. All terms, abbreviations, and measurements are American. If you need the British or metric terms and measurements, Craftsy has a really handy Metric Conversion Guide for Knitting & Crocheting HERE. 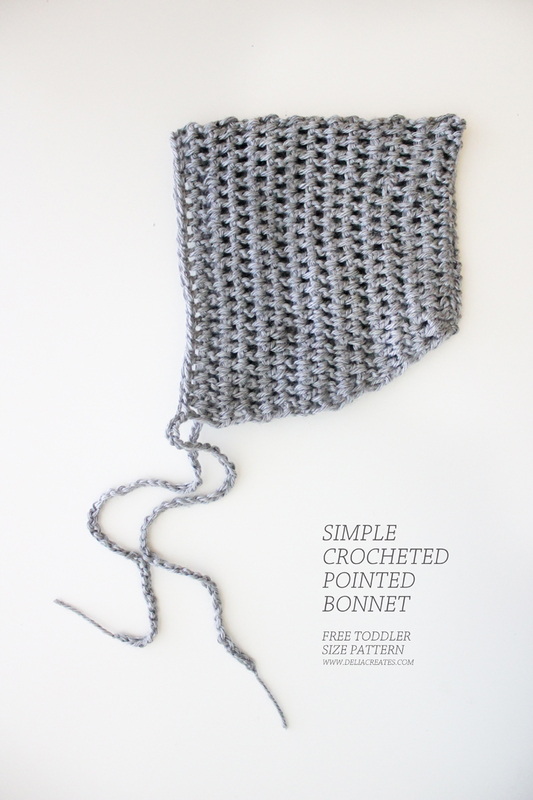 Let’s get to the bonnet pattern, shall we? Remember, I am using all American terms, hook sizes, and measurements. If you need to see the metric equivalent, see Craftsy’s Conversion Guide. *Instead of crocheting in the top two loops of the chain or row below, all dc will be crocheted in the space between stitches. 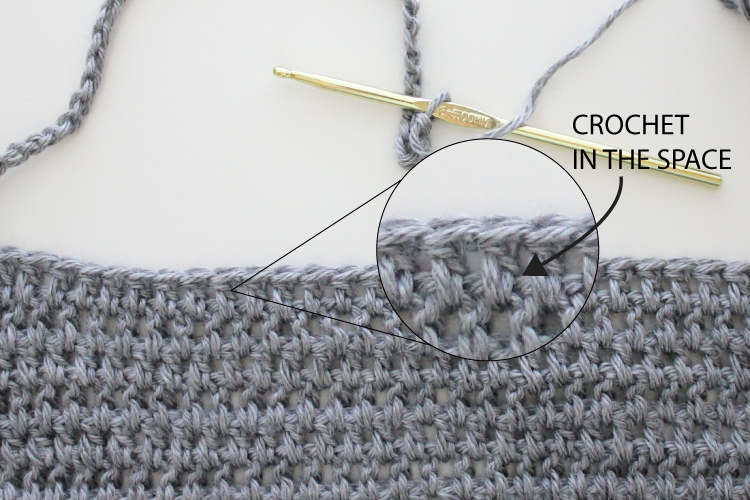 *Starting in row 3, you will see the pattern increase, which means that when indicated in the pattern, two stitches will be crocheted in one space, thus making the pattern lean out into a trapezoid shape. *The number in parentheses at the end of each row indicates how many stitches should be in that row. If your project ever starts to look off, count your stitches. It is likely that you skipped a stitch on accident. Foundation Row: Ch 36, turn. Rows 8-14: Repeat row 7. When you get to the end of the last row, chain about 15-20 chains to create a tie for your bonnet. Tie off and cut yarn. Insert hook in a space at the other end of the last row, and chain another tie. Tie off and cut yarn. Weave first tail into the hat. Lay the hat in half, with right sides facing. 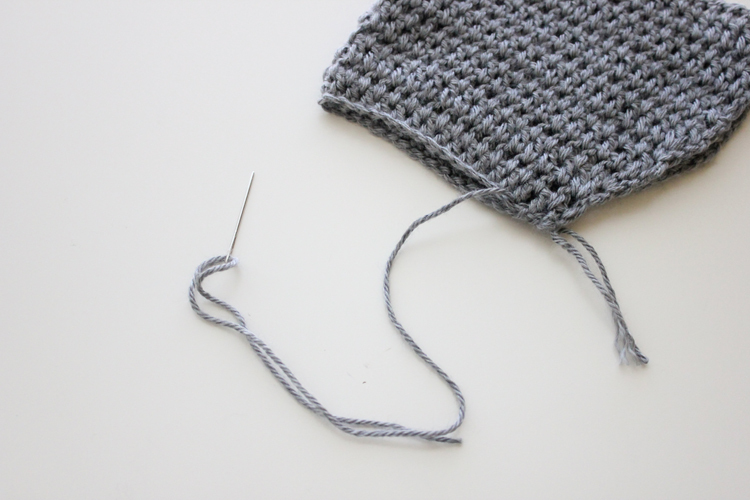 Sew up the back seam with a yarn needle or single crochet the seam together with your hook. Weave in all tails. It’s all done and ready to enjoy! This post was sponsored by Craftsy. Check out my other Craftsy sponsored posts HERE and HERE to see what else Craftsy has to offer. 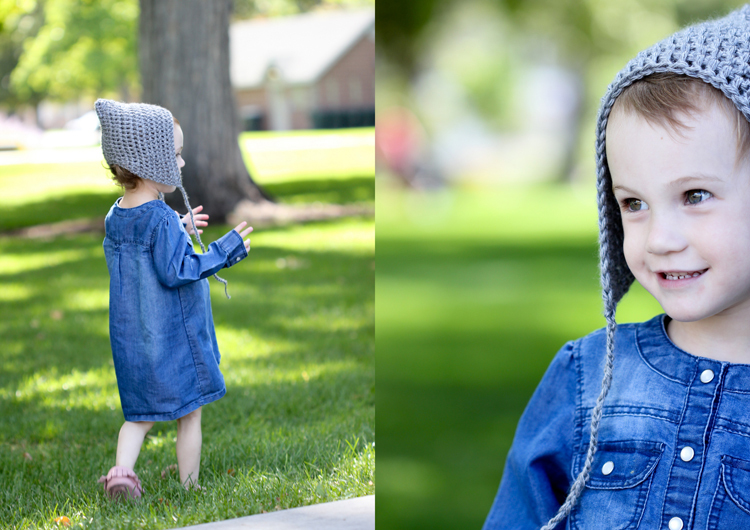 Delia i love that hat it inspired me to make myself the same hat its so cute! 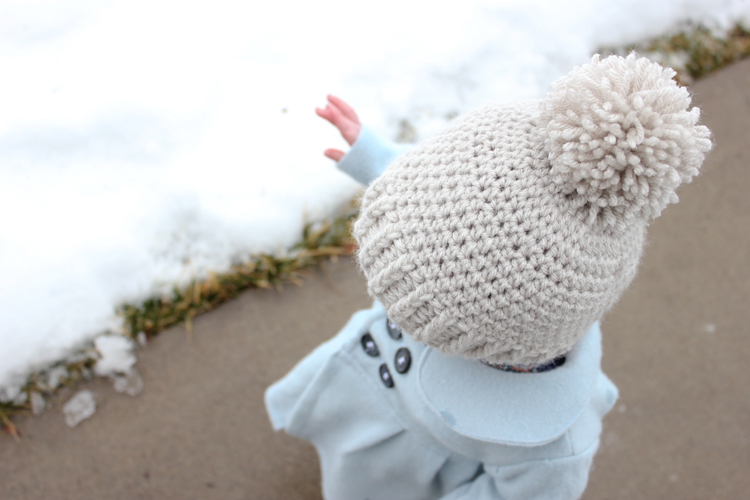 Love love love so cute i can’t wait to see how my hat turns out! (Probably not as good as hours though) but I love this pattern you sould make more hats and post them up because I’ll make them! So cute! Love <3 !!!!!!!!!!!!!!!!!!!! Oh thank you Louise! I am so glad it inspired you! 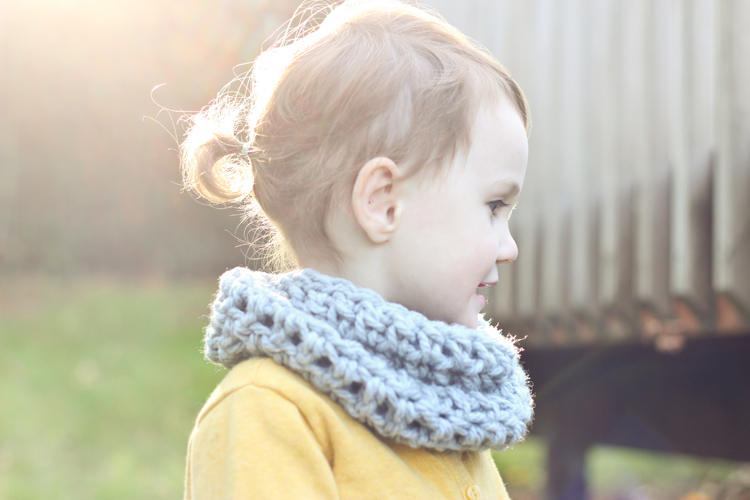 I may make some more in larger sizes, but there are just so many things I want to do! If only I could crochet more time. ;) ha. Wouldn’t that be something? Can you tell me the dimensions if the finished hat before it is sewn together please? Sure Jo! The shorter side is about 11 inches, the longer side is about 15 inches and the whole trapezoid shape is about 6.5 inches tall. I hope that helps! I have just started and my 12 stitches are only 3 inches, the longer side 10 inches. I’m way off. I’m using the same size hook and yarn and you have listed, and I crochet pretty loosely normally anyway. Suggestions?? I was thinking maybe a size up on the hook? To an ‘I’? Thanks!! Steph, sounds like an I hook would do it! 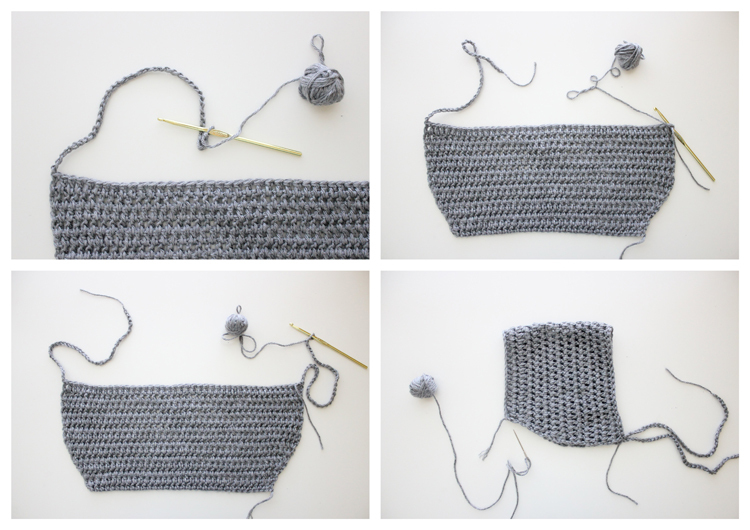 I usually crochet tightly, but when I crochet in the space, I loosen up my tension. Maybe that’s why! ha. :) I don’t know. I hope that works for you. I finished this hat today. It was my first crochet project ever (I just started learning this week). 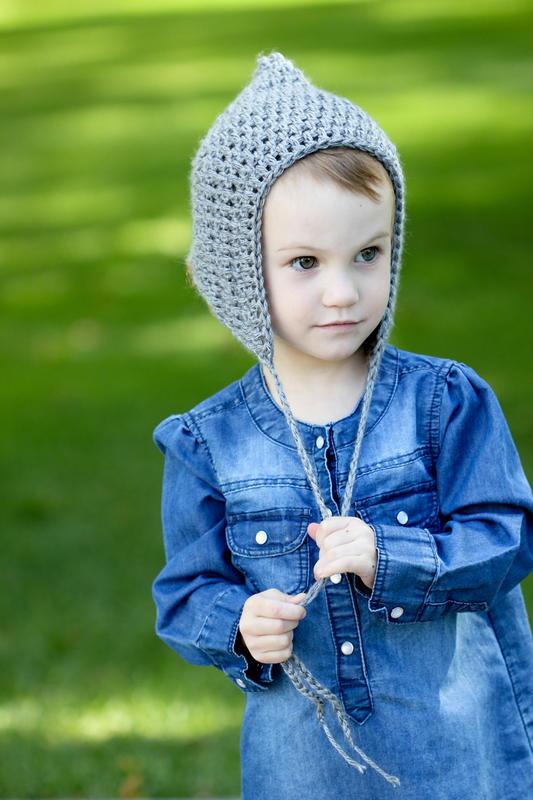 It turned out perfectly and looks adorable on my daughter. Thank you for a great, easy to follow pattern! Awesome Kirsten! 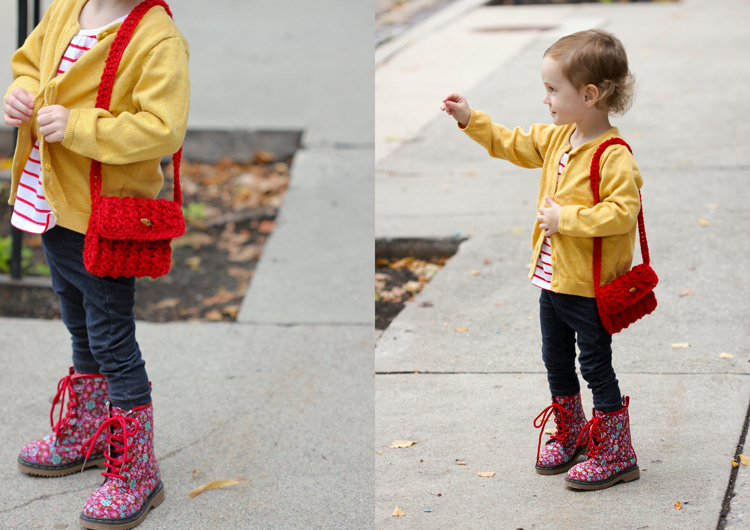 I am so glad you liked the pattern! Thank you for the pattern. I just finished it and it came out great! Question about this pattern and please excuse of it sounds simple but for row 2 and each subsequent row it starts with (ch 2). Does that mean to do 2 chain stitches before the dc or does that I indicate position? Great question! 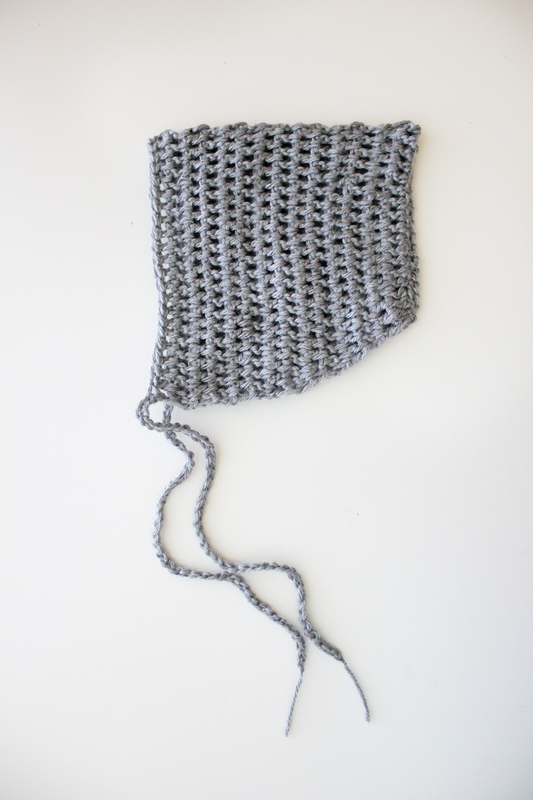 You chain two at the beginning of each row (which counts as one stitch in the stitch count for the row). I hope that helps. Please let me know if you have any more questions or need more clarification. I’m happy to help! 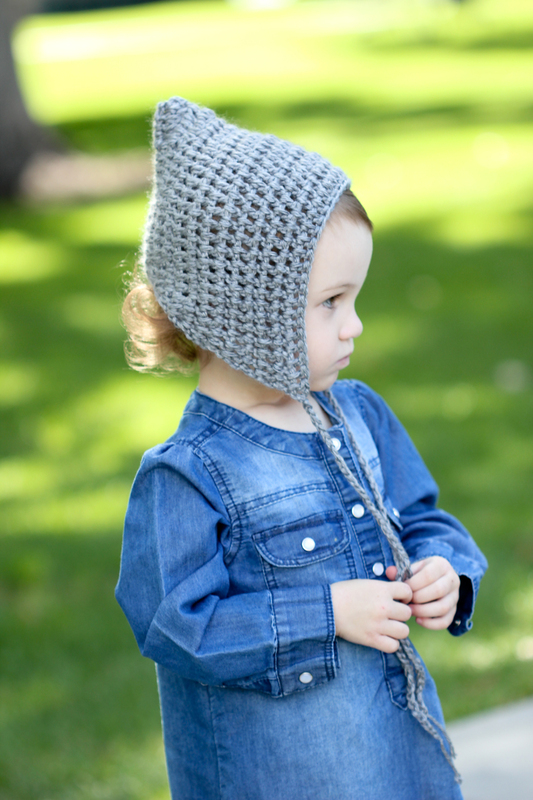 Ok seriously I never saw such an adorable looking bonnet in my entire life!! I have a little girl that’s 9 months old and I so wish you had the time to make me one!! Would you?? Please? With a cherry on top? Just wondering if you offer this is 0-6 and 6-12months?